Montreal Central is in a great location surrounded by shopping restaurants and public transport, within walking distance of Notre-Dame Basilica and Vieux Montreal. 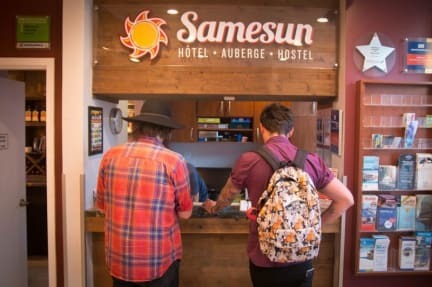 This hostel offers a lot of popular extras, such as free local calls, free breakfast, a mini-fridge in each room and lockers, reading lights and power sockets for each bed. 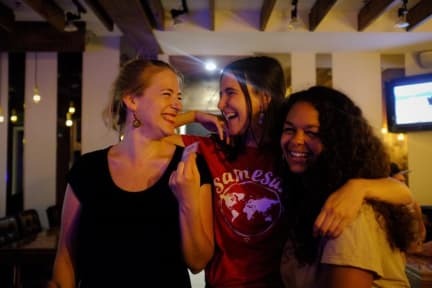 Hostelworld travellers tell us, 'every evening there is another programme, so when you don't know what to do, just go out partying with the hostel staff and guests; they know how and where to party'. Our friendly staff, intimate setting, ensuite, air conditioned rooms and central location add up to a hostel that’s been a ratings leader on Hostelworld for years. We’re surrounded by shopping, restaurants, nightlife and are steps to public transport. We’re also just a few minutes’ walk to area attractions (see list below) including the Notre-Dame Basilica and Vieux Montreal. After a day of exploring, or before your big night out, you can enjoy backpacker prices in our Rendevous Bar and a chat with our staff. We’re happy to hear about your day, clue you in on the best local’s place for French cuisine or help you plan what to see next. And the next morning, we’ll get your day started right with a breakfast of waffles, eggs, fresh fruit, baked goods and coffee/tea and juices. We even bake muffins in-house daily! I really enjoyed my stay, I was 10 days and the only bad idea that I had was about cleanliness. Don't talk about the lines but about dirty washrooms. We were in a 8 beds mixed room and some days the washroom didn't be cleaned. But the room was big, the matress confortable, the idea of fridge in the room was amazing. The front desk guys all nice. I'd come back one day. And the mixed room had more man than woman. Cheers!! !